Wow! After putting up the post on Acai we got pummeled with email telling us to talk about the superfood known as Goji. Ok Goji lovers you are almost convincing us that Gojis trumps Acai as the most potent superfood out there. Here is a quick rundown on Goji. 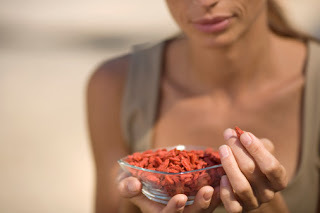 According to clinical studies and research, goji berries just might be the most nutritious food on the planet, as well as being the numero uno(#1 for you english speakers) super food. Goji berries have one of the highest antioxidant ratings, far more vitamin C than oranges, many times more nutritional iron than spinach, more amino acids than bee pollen, more beta carotene than carrots, cancer-fighting selenium and germanium, a unique polysaccharide found in no other food source known for its potential ability to increase HGH (human growth hormone) production, and being a dramatic immune system booster as well. Simply said it is a big time berry. It is found on a shrub that's native to China. In Asia, goji berries have been eaten for generations in the hopes of living longer. Cant hurt, why not try it? Cheers!